Every now and then, a movie comes along that completely destroys the conventions of its genre. Sometimes that works well, and other times it holds the movie back. It all depends upon the creative force behind the project. Ben and Josh Safdie have recently proven that they are more than capable to create a movie that defies all the rules expected in a feature film. Their newest film, Good Time, is the perfect example. The trailers for this movie had me really intrigued, but I didn’t get the proper feel of the style going into it. I honestly had no idea what to expect, but what I got was something so different and disturbing that I dare say this is a movie that should not be ignored. Good Time is a piece of art that defies all expectations and rules but also feels like one of the realest movies of 2017. Constantine Nikas (Robert Pattinson) is a petty thief who is looking for a score that could potentially change his life. He’s careless in many ways, bust most of all by utilizing the help of his mentally challenged younger brother, Nick (Ben Safdie), with his crimes. After successfully robbing a small New York bank for $65,000, Constantine and Nick think that they’ve made it out scot free. That is until a police officer gets too close to Nick and scares him, which sends the two brothers off running with the police in hot pursuit. After a chase, Nick is arrested, while Constantine ultimately gets away. After hearing about the abuse Nick is forced to put up with, Constantine begins an odyssey into the underbelly of New York City to raise $10,000 to bail his brother out of jail. As the night progresses and more altercations keeps Constantine from the money he needs, his desperation starts to wear him down and reveal a side of himself he didn’t want to believe existed. 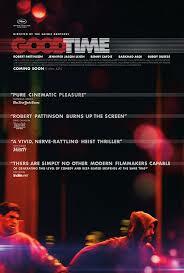 Something that I sort of guessed about Good Time is that it would feel very episodic. I had Collateral in mind before seeing this movie, but the two really don’t share many similarities. Good Time is very un-cinematic in the way it tells its story, and I found it a bit hard to grasp onto at first. The beginning of the movie really pulled me in, but it became hard to find the rhythm the story was moving at. After awhile, I decided to stop looking for it. I would simply let the film wash over me and wherever it went, I went. This is one of those movies that it all makes sense after it’s over and looking back on it, I appreciate it more than I did as I was watching it. Scenes lead into the next almost at random as small occurrences that seem minor are enough to shake up the lives of the few characters that share the screen. There’s little rhyme or reason as to why things happen, just that it’s the sole consequences of the characters and not for the sake of driving the plot forward. Some may say it’s anticlimactic. I say it’s brilliant. Speaking of un-cinematic, the look of Good Time is really something to behold. It was sort of marketed as this neon lit trip down the rabbit hole like something out of the mind of Nicolas Winding Refn. There are a few scenes that do go a little over the top with the lighting, and sometime it was a bit distracting. For the most part, however, that is not the style of this film. This is a grimy, dirty, and highly unflattering film. The sets are run down and gross and the actors are made to look their worst. These are bad people operating out of bad places and the Safdie brothers really work to make that clear. A lot of scenes are also shot using off balanced angles with the foreground obstructing the view or close ups that come across as jarring. This is a disturbing film and this is really the only way this film could’ve been shot. Any other way would’ve robbed the audience of the proper tone. I do wish that some scenes toned it down with the lighting however. They didn’t always fit. A while ago, I reviewed The Rover and I commented on Robert Pattinson’s understated but superb performance. Pattinson is one of those actors who can give an unexpectedly brilliant performance when paired with the right script and film maker. His understated performance in The Rover works really well, but his performance in Good Time is something else. This one is much more kinetic, dark, and completely devoid of innocence. His command of the screen is evident in this film and the weight of the character is clearly heavy, but he carries it all very well. Ben Safdie as his mentally challenged younger brother also gives a startlingly real performance that I wasn’t really expecting. There’s a strange cameo in the beginning by the always excellent Jennifer Jason Leigh to top off the cast of excellent performers. This may be one of the best acted movies of the entire year. Good Time is a truly unique cinematic experience by the Safdie brothers. I’m unfamiliar with their earlier works, but if it’s anything like this I really need to check it out. That being said, I’d love to see more from them in the future because this felt like pure, in your face cinema. This is a darkly disturbing film that will make you long for the shower after the credits start to roll. 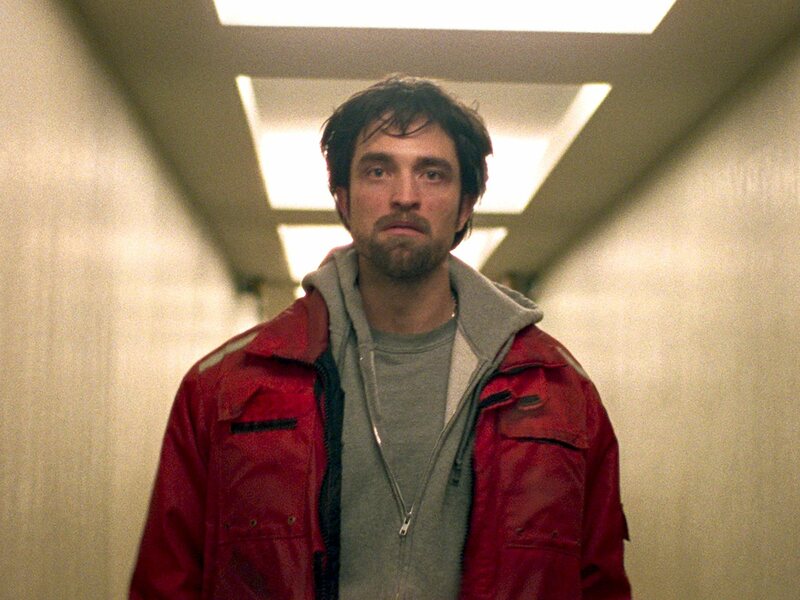 If you have become overwhelmed with the summer blockbusters that have all come and gone, take a look at Good Time, but make sure you buckle in first. Michael Haneke’s Funny Games (I’m partial to the 2007 version) is one of my favorite films of all time, and I’ve been severely slacking at watching some of his other works. I’ve finally gotten around to it with his 2005 critical success Caché. This film was nominated for the Palme d’Or at the 2005 Cannes Film Festival and many critics call it one of the best films of the 2000s. All of those critics kind of have to slow down a little bit there. 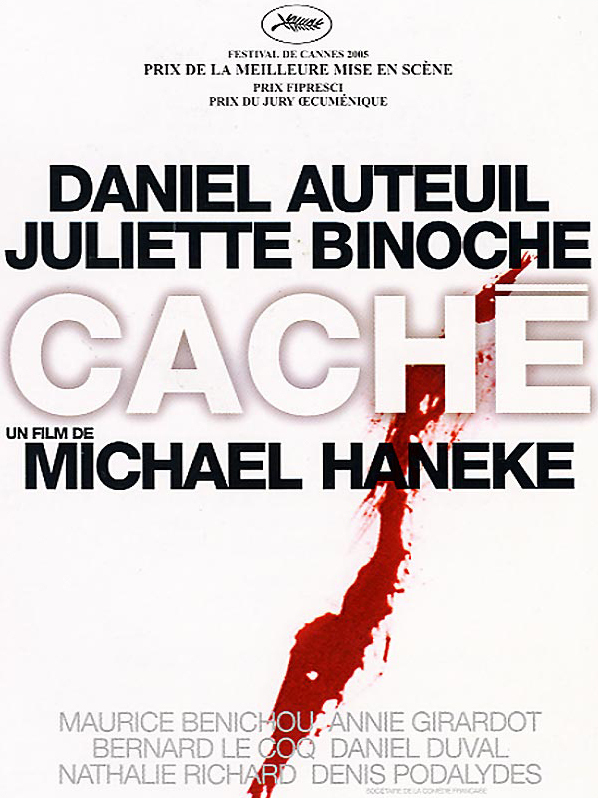 Caché is a very interesting and complex film when all is said and done, but it’s also extremely pretentious and often feels like a chore to sit through. The real joy of this movie comes through when you begin thinking about it after the credits roll. Georges (Daniel Auteuil) and Anne (Juiliette Binoche) Laurent are a upper middle class family living a relatively quiet life in Paris. Georges is a talk show host on a public television station, Anne works as a publisher, and they both have a 12 year old son named Pierrot (Lester Makedonsky). That quiet life soon gets uprooted when they begin finding videotapes from an anonymous stalker showing up at their doorstep. Why they are being recorded and who is responsible forces Georges to look back into his past and come to learn that actions he did when he was just a young boy could be the cause of the family’s stalker finally taking his revenge. Technically speaking, though, the movie is really cool. The very first shot lasts a few minutes, and just shows the front of the Laurent’s house. It’s a great opening shot and got me in the mood to see how Haneke’s artistic vision would help tell the story, but this trick is used a few times too many. The film is also shot on video, which is actually an appropriate choice since the whole plot revolves around videotapes being delivered to this family. All of the artistic qualities that are in Caché do enhance it and halp it stand apart from more run of the mill thrillers. I’m just saying that for me some of it was a bit too much for me. I will praise wholeheartedly the performances in this movie. Daniel Auteuil and Juliette Binoche work perfectly together and both of their performances are very natural and feel very real. The same can be said about everyone in the movie, even the younger actor, Lester Makedonsky. Someone who really steals the show every time he’s onscreen is Maurice Bénichou, and while he’s not present very much, every scene he’s in is memorable. This was a strange review to write because I liked Caché more as I thought about it, but as I was watching it, it felt pretty tiresome. This may be because the real payoff is looking back on the entire thing and putting all of the pieces together instead of just being confused the entire time. There’s that and the fact that Haneke goes a little overboard with long takes of nothing, which he is actually also guilty of in Funny Games, which I love. Caché is a memorable movie that is in the same vein as Hitchcock, but watching it is nowhere near as entertaining as it probably should be. To preface my review for Reservation Road, I think it’s appropriate to point out that not many movies have the intensity to push me to the verge of tears. It takes special kinds of films, like The Green Mile, to do this to me. Now I can say that Reservation Road can be added to this small list due to its excellent character development and intensely realistic themes. It is a day like any other in a small Connecticut town. Dwight Arno (Mark Ruffalo) is driving his son, Lucas (Eddie Alderson) back to his mother’s (Mira Sorvino) house after a memorable afternoon at a Red Sox game. Ethan (Joaquin Phoenix) and Grace (Jennifer Connelly) Lerner are driving their kids, Josh (Sean Curley) and Emma (Elle Fanning), home after a recital that Josh was in. While making a pit stop, two lives collide as Dwight accidentally hits Josh with his SUV, killing him. Instead of stopping, Dwight drives away out of fear. Now comes the turmoil of both families; one struggling with overwhelming guilt and the other obsessing over the truth. It would have been easy enough for this film to turn into a run of the mill melodrama, but I feel that it succeeds in crossing that line and becoming something much more powerful. This is done by the remarkable performances of the lead characters. Joaquin Phoenix lights up the screen with his fits of anger and sadness, showing that he has a very wide range of emotions as an actor. Jennifer Connelly also travels across a large character arc from despondent and grieving to a woman just trying to get on with life. The most interesting character for me though is Mark Ruffalo’s character, Dwight Arno. Recently, Ruffalo has caught my attention as being a fantastic and deep actor. His character in Reservation Road is very difficult because even though he has done a terrible thing, he is not a bad person. In fact, he is a very good hearted person who just so happens to have made a terrible mistake. There were times where I was hoping Arno would come out unscathed, but then it would dawn on me again that what he did is near unforgivable. The use of children in this movie also hits like a sucker punch to the throat. Seeing how kids react to a tragedy like this is difficult to watch. Elle Fanning gives an impressive performance as the little sister whose brother has been killed. Eddie Alderson also gives a fine performance, although Elle’s character gets to explore more emotion. There aren’t any tricks in Reservation Road, and for good reason. The camera work and cinematography are just fine, but nothing special. If their were loads of stylized camera movement and dramatic lighting, than the story would feel less intense I feel. Terry George, who also directed the powerhouse Hotel Rwanda, puts story and character development above all else. There are a few plot points that feel a little stretched. By that, I mean they seem rather unlikely. For drama’s sake, they work pretty well in creating extra depressingly awkward tension and suspense. If the viewer can suspend some disbelief, than these points won’t be a problem. It is true, however, that the other realistic points are affected by the unrealistic. 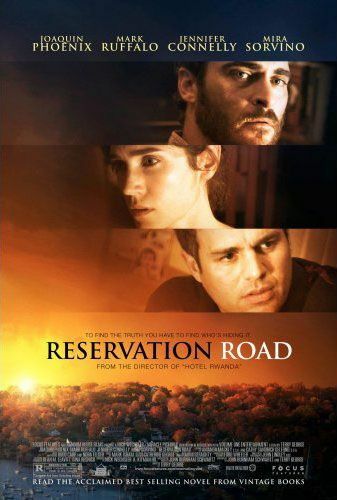 Reservation Road is one hell of a film. Terry George succeeds, almost 100%, in creating an intense, believable narrative full of pure human emotion and the consequences of our actions. After watching this movie, I tried to put myself in the places of both Ruffalo’s and Phoenix’s characters. This gets you to thinking about your own morality and ability to handle loss. Sure, the film may feel melodramatic at times and there may be some unlikely scenarios, but don’t let this stop you from seeing Reservation Road.